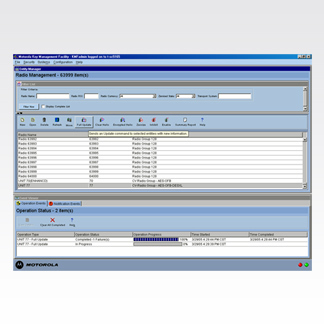 Key Management Security - ConnecTel, Inc. The Key Management Facility (KMF) is a Project 25-compliant mission critical enterprise solution that can facilitate secure key management and distribution. It enables effective planning, implementation, and execution of security doctrine — all adaptable to user requirements. The KMF is composed of: (1) Windows® 2008 Server; (2) KMF Server and Client Software; (3) Windows 7 Client; and (4) KMF CRYPTR. Allows users to visually track members and group encryption keys. Users link Groups, Unit, and CKR to most effectively organize system. Allows operator to inhibit and enable radios within the network. Eliminates the need to manually rekey radios. Frees operators from reliance on third party suppliers or manual key material generation. During rekeying operation, associations between units and the KVL 3000 can be performed directly from the user interface. "Store-&-Forward" permits a user to reach remote units during rekey process. Enhances security by protecting all mission-critical communications. Determines whether a radio is within range without causing extra voice traffic.